Sustainable architecture is way more than just a green facade. During the tour we look at examples that address different aspects of sustainability: ecological, affordable, community oriented housing, neighborhood gardens and experimental temporal structures from recycled materials. We talk about saving and sharing resources as well as about adopting architecture and urban planning strategies to the diversity of modern live styles and the demographic change. An innovative combination of private and public uses, temporary and permanent projects, living and working, urban farming and culture. Is that possible? “Yes, of course!”, say the architects Zusammenarbeiter, Spreefeld project planners. 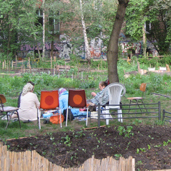 Emerging on a field attractively located on downtown Berlin’s riverside, the Spreefeld is a unique experiment of cooperative self-organization and direct citizens’ participation. 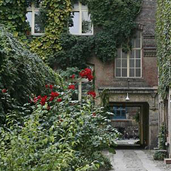 Neighboring Berlin’s oldest squat, the Rauchhaus, this intercultural garden is a place for all kinds of people from the Kreuzberg neighborhood. Community grown vegetables, flowers and herbs show the strong integrative and positive societal effects of this project. 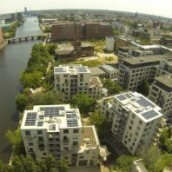 Developed as a cooperative residential community, the Forum-Kreuzberg houses a great variety of pioneering projects and initiatives including a community college, kindergarten, health care practice, theater, workshops and artists’ studios taking part in the modern history of community-oriented projects in Berlin.